World 8-2 is the second level of World 8 in Super Mario 3D Land. This level takes place in grassy summits. Mario begins the level on a small peak, where a tree and some dandelions are found. Three poles can be used to reach a summit, where Rocket Engines, two Prongos and a ? Block are found. Another pole moves through a rope to transport the player to another mountain, which holds a Coin Coffer, spinning platforms, the Checkpoint Flag and more Prongos and Rocket Engines. 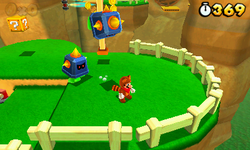 Mario crosses gaps using moving poles and Donut Blocks, avoiding flames. On the last piece of land, the are spinning platforms and the Goal Pole. Star Medal 1: Climbing up the second pole at the beginning of the level take the player to this easy to reach Star Medal. Star Medal 2: While the player is on the rotating platform below the Rocket Burners, they should jump to the Donut Lifts on the right for the second Star Medal. Star Medal 3: The final Star Medal is found on some Donut Lifts at the end of the level.